1. Preheat the oven to 200 ̊C, gas mark 6. Toss the lamb with 2 tbsp oil and the spices; season. Heat a large frying pan until smoking. Brown the lamb in batches for 7-8 minutes, stirring occasionally. Spread on a baking tray. 2. Fry the cauliflower in the same pan for 2-3 minutes, then stir in the pine nuts. Transfer to the tray; roast for 15-20 minutes, until tender. 3. Meanwhile, whizz the chick peas in a food processor or blender. Add the tahini, lemon juice, crushed garlic and 250ml warm water, then season and whizz again, scraping down the sides, until smooth. 4. 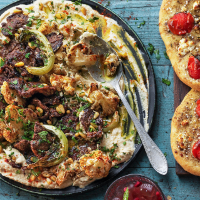 Spread the houmous on a platter, top with the lamb, cauliflower and nuts, then the herbs, lemon zest, and a little more oil and paprika.